Illustration Courtesy of G-Outdoors, Inc. When we first saw the G.P.S. Black Powder Binder, we immediately knew that it was going to be a permanent part of our equipment. It now comes with us when we go to the range to test new muzzleloaders, or sight in our own muzzleloaders for a hunt. When testing new rifles, we keep detailed notes of our results. In the past, some of our notes got misplaced or damaged at the range, but not anymore. The four plastic pages on the rings are like heavy duty page protectors with zip-lock seals. They are ideal for keeping our range records: chronograph results, targets, loads and weather conditions. Our records are now always in the same place for quick access. 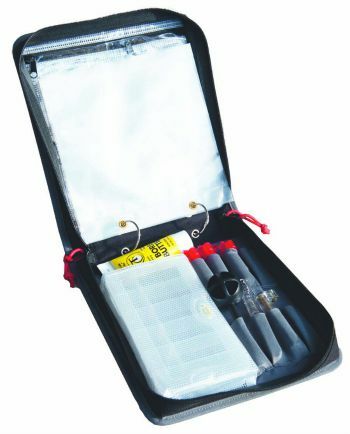 The hard-sided binder has four zippered pockets inside the top lid that are ideal for a box of 209 primers and some small tools, such as the primer removal tool, a cleaning cable and some Rigel bore brushes and triangle patches. Just enough for an afternoon's shooting. While other folks might use the included plastic box for tools, we use it for our bullets and sabots. There is plenty of room for fifteen CVA Aerolite bullets and fifteen Harvester Scorpion PT Gold bullets with their sabots. Although we rarely shoot that many rounds (30) in a single afternoon (Jim's shoulder wouldn't take it), they are there in case someone at the range wants to try their hand with a muzzleloader. What is really nice about this binder is that it opens up and lays flat on the shooting bench, making everything readily accessible when needed. We added our bullet starter, a tube of bore cleaner and even our PAST recoil pad. Although the Binder has sleeves for powder tubes, we usually take our powder in a separate container. If you don't like the idea of taking along a separate powder container, there is room in the Binder for a cylinder field powder flask and powder measure. While the G.P.S. Black Powder Binder might not be for everyone, we think that most shooters will appreciate its value, once they try it. With an MSRP of $29.99, it is well worth the investment.